Have Health Concerns about Lariam been overstated? I have used Lariam during two post Peace Corps (Paraguay) trips to South America. I spent 3 weeks in the Peruvian jungle (Amazon) in 1999 and again in 2001. The first time I had sensations of vertigo and "energetic" dreams (not quite nightmares). The second time I experienced less of these symptoms. I am aware of some health-care personnel who did experience severe psychological problems while on the same trips as I was...but no conclusive evidence pinpointed Lariam as the problem. It is evident that additional testing is warranted. I am a RPCV who has taken lariam on four separate occasions: 1. For 16 months from July '95-Oct '97 (Malawi), 2. For two months during Feb-Mar '99 (Vera Cruz Mexico), 3. For seven months from Sep 2000-Apr 2001 (Bihar India) and 4. For four months from January-May 2002 (Ghana). Still, I am very conservative about ingesting any drug. I explored before taking lariam and am still convinced it offers the greatest benefit and the least risks of the various options available. My noticeable effects are: distinctly vivid but pleasant aninmal dreams on the first day and slight vertigo on the sixth or seventh day. The only severe psyschiatric reaction that I have been aware of was in a PCV who had had previously been diagnosed and treated for psychiatric problems. On the other hand, I saw two volunteers with severe neurological malaria who were not taking the drug and I am aware of the death from malaria of a high level CDC consultant in Ghana in 2000; it is my understanding that he was also not taking a malaria prophylactic. Until I am convinced that risk-benefit is the opposite of what I now perceive it to be, I will continue with lariam. I hope Peace Corps can influence the goverment and pharmaceutical companies to fund related research at one or more of the Peace Corps fellow institutions. Lariam Action USA had a booth at the NPCA convention June 21-22. We talked to HUNDREDS of RPCVs, many reporting mild to severe side effects from the drug. Some of them were "psych-evaced" home due to Lariam toxicity. For the latest international news and research about this drug, please visit www.lariaminfo.homestead.com. In a few days we will post a petition asking Congress to hold hearings on this drug and to force the manufacturer (Roche) to give doctors and Lariam users information in plain English on the side effects Lariam can cause. There are two equally effective and safer antimalarial drugs available in the US -- doxycycline (a common, generic antibiotic) and Malarone (on the market for the past two years). We believe all travelers and PCVs should know that these drugs are available, so they may make an informed choice about malaria prevention. While I was a volunteer (Niger '95-'98), I took my mefloquine religiously every week. I knew many other Volunteers who stopped taking their mefloquine and either switched to doxycycline or no prophylaxis at all. Most of these people had one or another bad experience with mefloquine, including one of my colleagues who had a middle-of-the-night panic attack that led him to ride 6 miles out his village on his bike to get to a regional hostel. I had no noticeable side effects (except poor circulation - "pins and needles") while I was taking mefloquine. However, six months after I got home, I began having seizures. While I know there is no way to prove a link with the mefloquine, there has been no other explanation offered to me by my doctors. When I contacted Peace Corps, they made it clear that I was on my own and that they would not be able to help me even get more information. So while I will never be sure that my seizure condition, which it appears I will live with for the rest of my life, was caused by the mefloquine, I do feel like Peace Corps was not forthcoming in assisting me to make an informed decision about my medication, nor in finding out what it might have done to me. I believe they should provide as much information as possible to new trainees so that they know what they're getting into. I do believe that it is foolish to risk getting malaria. However, when the prophylaxis itself presents other risks, the user needs to be fully informed to make a wise decision about how to proceed and which medication to take. Hi there! I was a PCV in Botswana and took Lariam/Mefloquine for three years while I was overseas. Luckily, I did not have any side effects. But others in my group did have some psych-related side effects. Thanks. I was comforted to know that symptoms I have felt after taking the oral malaria prophylactic "Lariam/mefloquin" were widespread. This message is actually in response to Mike Renning whom I know personally from my service in Peace Corps Niger. 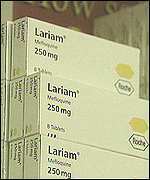 When I arrived as a volunteer in Niger (98), I began taking the lariam medication. For the first several months I had the vivid dreams, even often dreams of amorouness which wasn't so bad. After several more months, my dreams began to get more intense and became nightmares. I often woke up in a frenzy. I can recall one time when I was sleeping in the hostile and thought another PCV was trying to attack and kill me in my sleep. I jumped up and grabbed them still half asleep trying to defend my life. One other nightmare I will never forget, and still haunts me, is waking up in my "Hausa" bed under my mosquito net. Still half dazed from sleeping, I thought I saw a black-necked spitting cobra dangling from my mosquito net in the moonlight and inside my net! I was so terrified, I jumped up out of my bed, not even untucking my mosquito net and ripped it apart as I ran into my house. Several more dreams like this continued. How could I have these nightmares when I adore wildlife and have never been afraid of snakes, lions, etc? I'm not going to say mefloquin, but who knows. Several more months after this, I began to experience severe panic attacks, heart palpitations, etc. Classic anxiety symptoms. I dealt with it as long as I could until I finally asked for psych-evac. I immediately quit mefloquin and went to dioxy. The problem with this transfer is that mefloquin accumulates and accumulates in your system. It's not like you will notice immediate relief from symptoms. It took me almost 6 months! I personally will never take the experimental drug again. There is no long term data for the drug and it hasn't been highly studied. Some people say PCV's were the guinnea pigs. When you look at the overall picture, some individuals are more sensitive to certain chemicals and drugs than others (i.e. penicillin, sulfa drugs,etc.). For me, I believe it took a while to build up in my blood, which eventually caused a chemical imbalance, and anxiety symptoms. Some individuals can take it for years and experience nothing. In which case, I can't think of a better way to avoid malaria. For me, it has now been several years since, not one nightmare! Lastly, I just want to mention that no malaria drug is 100% effective in malaria prevention. I took my mefloquin religously, like I mentioned, even after symptoms occurred. I still got malaria. It does however prevent, more effectively, your chances of getting cerebral malaria, or the faliciparium strain of the virus. You should always take something. Well, I thought I would share my stories with you all and am happy to hear that RPCV's are stateside and leading productive lives. As the zarma say "Kalla han fo". How many volunteersw die in service or commit suicide during or after service? I've taken it twice... the first time I a got blocked ear, tinnitus and some vertigo. Didn't associate it with the drug. The second time... blocked ear, tinnitus, vivid dreams lots of thought about suicide (I don't know why, I wasn't unhappy) and then violent vertigo. For the ear problems and the vertogo the doctor diagnosed Meniere's disease, which is an incurable vestibular disorder. It's too much of a coincidence for me that I was taking Larium when I got the disease, and Larium bought on my second attack... regrettably, stopping taking it has not stopped the disease. Took a single pill of laraim before a trip to asia. Had sever side effects on the very same night(palpitations, nerve burning, fatigue, dizziness, gastrointestinal problems). Since I was not on any other medication and was extremely healty and happy at that point. It was identified as ADR to lariam and I stopped the drug. It has been 20 months since then and I am still going through a 'roller coaster' ride with Lariam ADR. No doctor is in US has been able to help me out. Each and every test comes out fine. Paul Merton, the british comedian from "Have I got News For You?" famously had a major psychotic breakdown after taking Lariam. You may be able to youtube his story. I know people who've died from malaria. My sister had it as a baby. I have had it 5 times. Don't, don't, don't take any chances. Talk to your doctor. These stories are true, people can have bad reactions, but lariam is a relatively old medication and there are a variety of others. Stay safe and enjoy the trip, experience, of a lifetime. I was pretty pyschotic before taking Larium, and, as it was my first time away from home, (I was 18, on a gap year) I had some emotional experiences and weird dreams. As I wasn't a stable case in the first place, it's hard to establish to what extent the Larium contributed to my psychological breakdown.